This is a short catalogue of my passions linked with Bosnia: this is not a nostalgic narrative, but rather an overview of texts, people, and things that largely determined my life. As an only child who lived on books in a Belgrade family of limited means, I enjoyed considerable privileges. Among other things (once they had taken out a cash loan and bought a brand new Fiat 600 in “sour cherry” and started going on regular seaside vacations), my mother and my stepfather were ready to sacrifice an entire day in order to allow me to take photos in peace and quiet (with my Russian-made Leica) and mediate on the Višegrad Bridge. My early obsession with Ivo Andrić withered by the end of high school. My parents preferred an additional night with their Jewish friends in Sarajevo, in a beautiful flat in the centre, with a long coffee and a chat in the morning, while I wondered around the Old Town. While studying classics at the University in Belgrade, I was lucky enough to be a personal assistant to the then already retired brilliant Balkan scholar, Milan Budimir. Originally from Mrkonjić Grad, 1 he attended the Classical High School in Sarajevo and gave private math tutorials to Gavrilo Princip. 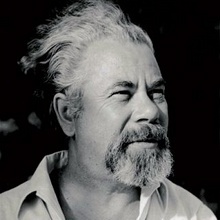 He then studied in Vienna and was active in the Yugoslav movement. During the war, he ended up in a Hungarian prison, where he lost his eyesight. 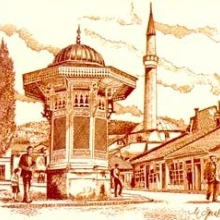 At the end of World War I, he returned to Sarajevo. The democratic and multicultural programme was inevitably vanishing in the new monarchy, and he tried to revive it through Radikalno-demokratska-napredna omladina (Radical Democratic Progressive Youth), an organization founded by Budimir, which brought together Serb, Croat, Muslim and Jewish intelligentsia (including progressive clergy). Following an election result in Ilidža, it became clear that this was not a viable option. While in Sarajevo, he edited The Eye, a satirical magazine, and then he moved to the University of Belgrade. 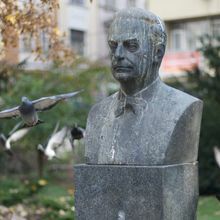 After his death, Budimir’s work became an important influence in my own reconstruction of the intellectual situation in Yugoslavia and the Balkans between two world wars and the development of Balkan studies at the time. My work depended on my research at the Library of the National Museum in Sarajevo. In 1968, I was part of what was defined in Yugoslavia as dissidents – a colourful group. I had my passport confiscated several times, and I was deprived of it for a total of seven years. Undercover police officers followed me and once even gave me a serious beating. I could not be hired by the University despite being the best student of the University of Belgrade for two academic years. I could only be employed by a research institute, which was a limited-duration haven of sorts for people like me. My dissident friends ended up in prison. The thaw started after Tito’s death in 1980, evidently in Belgrade, Zagreb, and Ljubljana, but not in Bosnia: the cult of Tito almost became even stronger there, repression did not ease. My first “case” in 1983, which I recommended to Amnesty International, with the help of other dissidents (and at the cost of several interrogations by secret police), was a Bosnia director of a major factory, a former World War II resistance fighter, who told a joke in a bar about the then chief of police in Bosnia. I met him by accident in a hospital in Ljubljana, where my husband was being treated. He had been transferred from the Zenica Prison, where an untreated gangrene had cost him a leg, for a complicated kidney operation to be performed in Ljubljana because the whole story could have turned unpleasant. At the time, particularly during the Winter Olympic Games in Sarajevo thirty years ago, Bosnia was a bastion of hard-core Titoism and state-police repression. Much of that was explained to me by Alija Izetbegović in his letters – since, in 1986, I was his advocate as president of the Committee for Protection of Artistic Freedom of the Serbian Writers Association. Another “case,” among many whose liberation I advocated through petitions, was the subsequently convicted war criminal, Vojislav Šešelj – also a Bosnian. Finally then, following the successful campaign to release Adem Demaqi, an Albanian prisoner of conscience who had been imprisoned by Serbia longer than Mandela (29 years), I paid the price of my comfortable researcher life: I lost my job, I was subjected to a media onslaught, and I ended up in court. However, times were different and the judge acquitted me with no difficulties. As an unemployed scientist, in fact, I had many more opportunities for action. And again, Bosnia was crucial for me. During the 1980s, Bosnia made its own contribution to the awakening of the Yugoslav civic consciousness and did so in two unexpected forms – a children’s TV programme entitled No One Like Me (Niko kao ja), directed by two talented young directors and shown by TV Sarajevo, and rock music – and Bijelo dugme above all. 2 For me, their song Kosovska (1983) was revolutionary: they took a bland pop festival song with shallow verse in Albanian and performed it in such a way that the only associations were to the position of the Kosovo Albanians, apartheid in Kosovo, and the necessity of rebellion. Towards the end of the 1980s, most of the dissidents in Yugoslav capitals had become openly nationalistic – they were showing their true colours. I no longer saw myself as one of them, and I looked for horizons elsewhere – Yugoslav feminism, which declared a clear stand against nationalism and the looming threat of war, and my Bosnian friends in an atmosphere of an all-Bosnian turn towards Yugoslavism and peace. And thus yet again Bosnia became the place of my determination. I travelled to Sarajevo frequently in the years just before the war: it was the place where one could speak against nationalism and in favour of preserving Yugoslavia, it was the centre of the Yugoslav pacifist culture, with rallies, concerts for peace, plays, and public debates. At the same time, it was becoming tragically clear that this was the reason why Bosnia had to become the greatest victim. At one point in 1990, my husband and I considered moving to Sarajevo because both Belgrade and Ljubljana were becoming difficult to bear, with all the nationalism and hate-speech. When the war against Sarajevo started, my colleague Zoran Mutić, an English and Greek scholar, translator of Giorgos Seferis, Salman Rushdie and many others, travelled along village roads, by land and sea, to Ljubljana, since I had invited him to deliver a lecture, sensing how things were to develop. And he stayed for five years. During the war, many Bosnians stayed at our home. For me, Zoran and the tortured Bosnia marked my transition to maturity in every sense. I still often travel to Sarajevo and other Bosnian cities, and I feel the horrors of the current Bosnian social and cultural situation as my own. Separation is no longer possible.